Well, I see you were brave enough to click on the About Us tab so allow me to introduce myslef. I’m Guy Gasser, your friendly neighborhood proprietor for HB Philatelics and this site. This is a new beginning for me. I started this dealership in November of 2009 as a part time gig while still on active duty with the U.S. Army. Then June 1st, 2011 happened. I retired after serving 30 years in the Regular Army. I am originally from Helena, Montana, but currently reside in Florissant, Missouri, a suburb of St. Louis to the North. I have a bachelor’s degree from the United States Military Academy at West Point and a Master of Business Administration from Regis University in Denver, Colorado. Okay, great. Now what to do? Why not give back to the hobby as not only one who has collected for years, but as a dealer to help others learn and enjoy this hobby just as much, and ya, perhaps make a buck or two. After all, this is a business. It is now 45 some odd years later and I am still at it, but now from both sides of the table although the collecting part has fallen way off. Something about this new day job! I have been a member of the APS since 2006, #204487. I am also a member of the United States Classics Society, two stamp clubs (Greater Mound City and Webster Groves) in the St. Louis area, regularly subscribe to several philatelic magazines, and have started to build a pretty good reference library. The ‘rest of us’ are a few idiot collectors who happen to be friends who want to see this idea succeed, and therefore have given of their time, energy, and sanity to get this business up and running, the inventory entered, the stamps sorted, the certs filed, and so on. Any errors are most certainly theirs. Please bring them to my attention so that the beatings may commence until morale improves. The terms and conditions of sale are pretty simple and straight forward for HB Philatelics. The satisfaction of the buyer is the number one priority. If you don’t like it, return it! I’ll give you a full refund. Still, there are things that need clarified, so see below. 1. I accept payment in US dollars only via cash, money orders, checks, Paypal, and all major credit cards. 2. If the buyer has purchased from me in the past or if not and has two references, I will offer terms of payment over time. I am willing to negotiate these terms so they will be unique to each customer. I don’t hold the stamps during payment. 3. I will ship via the postal service (USPS) unless the buyer requests otherwise. I will ship 1st class mail for invoices under $100 and certified mail for any purchase over $100, but less than $2,000. If the purchase is over $2,000, I will ship registered mail. Insurance is the buyer’s choice and own risk. If the buyer prefers any other method or type of shipping, please contact me. The cost of shipping is the cost to mail the items plus $1.00 for materials. 4. Missouri residents add 6.925% sales tax. 5. Look at my show schedule. If we are going to be in the same place let me know and the buyer can pick up their purchases at the show, we can meet and shake hands, and save the shipping charges as well as any chance of damage through the mail. 1. Returns are simple. As stated above, if you don’t like it simply return it (in the same condition as received obviously) for a full refund. If the buyer isn’t happy, I’m not happy! 2. Expertizing (Non-graded Certs). Obviously all stamps purchased through me on this site come with at least a certificate of authenticity from PSE, and most are also graded. Some stamps also come with a history of certificiates from other sources. However, should the most current certificate for the stamp purchased be more than 5 years old, and the buyer decide to send the stamp to an expertizing agency for an updated certification, please let me know within a week of receiving the stamp(s). Should the stamp come back not as described, return the stamp for a full refund and I will also refund the cost of the cert. 3. Expertizing (Graded Certs). Same as above except I will not refund the cost of the certificate for a grade that doesn’t meet with the buyer’s liking, or for an updated already graded certificate that comes back with a lower grade. As all collectors and philatelists should know, while there is a standard in the Scott catalog, grading is still very subjective. 4. I will accept certificates from the following expertizing agencies. If the buyer wishes to use some other agency, please contact me first. 5. Approvals. I still remember the days before the Internet. 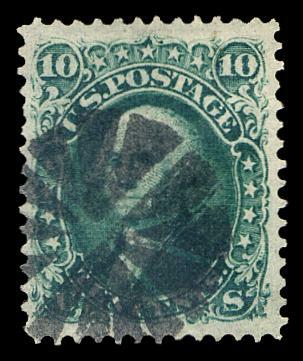 Even though the buyer can see images of the stamps I offer on this site, not everyone has Internet access. I can send photos and or scans of any stamp(s), and I will also gladly send stamps on approval. On approval is simple. Like ‘em, send me payment. Don’t like ‘em, send them back. A very nice red brown with a blue CDS cancel. A very nice looking stamp with an extra, extra, extra light hinge. Wonderful looking stamp for someone. 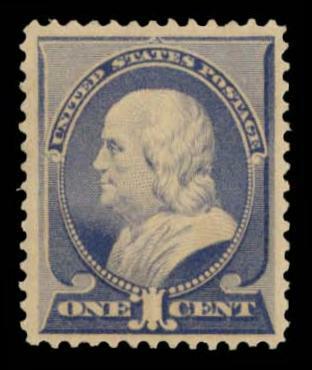 Good quality stamp looking for a nice home. A great looking classic with a light straight line grid cancel.